NGC 3324 lies in the northwest corner of the southern constellation of Carina. It is a giant, cavernous gas cavity carved out by intense UV radiaiton and stellar winds from young hot white stars. Actually, NGC 3324 refers to the open cluster of 20 O- and B-type stars. The nebular HII region is referred to as G 31. It is located at RA 10 hrs 37.3 min and DEC -58 deg 38 min with an apparent magnitude of 6.7, an apparent diameter of the cavity of ~ 16′ and is about 10,200 light years distant. 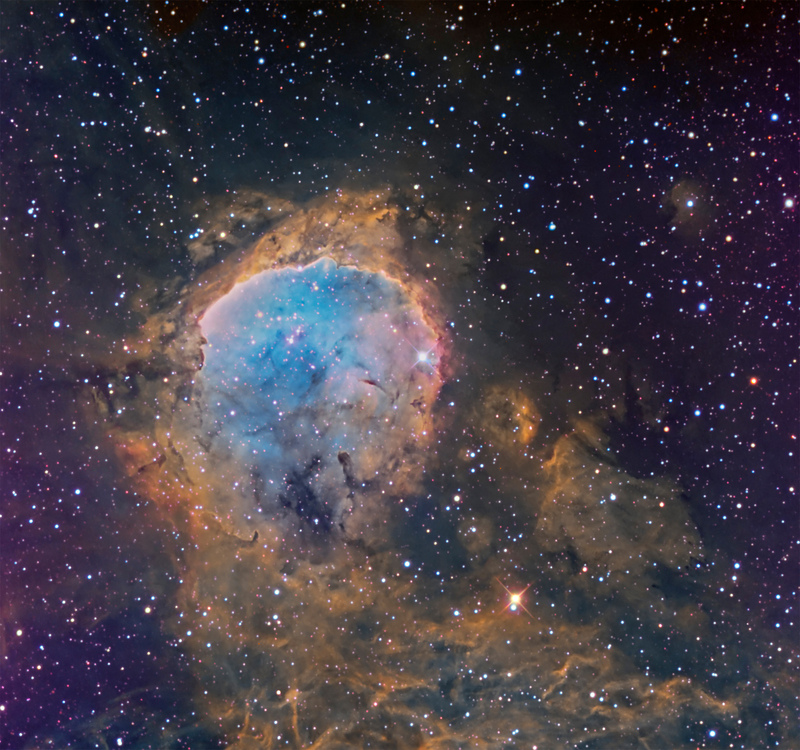 It is also known as the Gabriela Mistral Nebula, because of the upper rim portion of the cavity shown above has a likeness to the profile of a Nobel award-winning Chilean poet, Gabriela Mistral (see animation). NGC 3324 was the subject of a Hubble Space Telescope image, showing a portion of the upper "rim" of the cavity shown in the image above. Narrowband emissions mapped to B= OIII, G = H-a and R = SII (Hubble Palette).